After a shaky first term, Richmond has won each of the following three quarters to pull away and win by 19 points. The Tigers were particularly effective scoring from repeat entries, with 47 midfield intercepts resulting 22 inside 50s and nine goals. Richmond InterchangeJason Castagna replaces Shaun Grigg due to the blood rule. That's the second time from their past six kickins that the Tigers have gone end-to-end to goal directly. Last season Richmond averaged just 1.8 points per game from this source, the lowest tally of any club in the league. Josh Jenkins has impressed from limited opportunities tonight, kicking four goals from four shots. This is his largest goal tally in a preseason match, after recording 15 goals from 17 prior matches. Richmond supporters will see promising signs from midfield additions in Prestia and Caddy. The pair have gathered 21 disposals each, as well as combining for eight of the Tigers' 33 clearances. Richmond has been able to move the ball effectively, transitioning from defensive 50 to forward 50 on nine from 28 attempts (32 per cent) for 3.2 (20). Last season the Tigers went coastto-coast on just 17 per cent of attempts, ranked 17th in the league. Matt Crouch looks set for another prolific year, with 23 disposals mostly sourced through 15 handball receives. Last season, the younger Crouch brother averaged 27.7 disposals per game, ranked first at Adelaide and 21st in the league. All nine of Adelaide's goals have come from set shots, with seven from marks and two from free kicks. In 2016 the Crows did not rely so much on set shots, with just 42.5 per cent of their score from that shot type (ranked 16th in the league). Richmond has now won the last 11 centre bounce clearances for the game, with former Sun Dion Prestia leading the way with four. Last season the Tigers broke even at the restart, winning 0.3 fewer centre clearances per game than their opposition. Richmond dominated out of the centre in the third quarter, winning all eight centre clearances. The Tigers only converted on of these directly into a goal, however they also managed two other majors from repeat entries following forward half intercepts. Menzel's missed snap late in the quarter has turned very costly for the Crows, with the Tigers taking the ball endto-end directly from the resulting kick-in to record its fifth goal for the term after the siren. 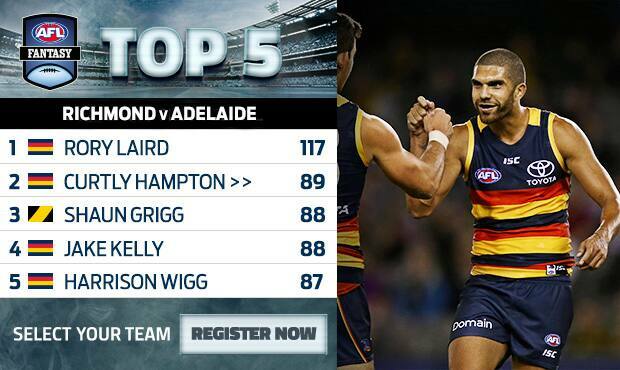 Curtly Hampton has shown some promising signs for Adelaide across halfforward. The former Giant - in his first game in the navy, red and gold - has amassed ten disposals, three inside 50s, two goals and one goal assist. The Tigers continue their dominance at the stoppage and it's finally paid off directly with a goal to Lloyd. Richmond has won 16 of the past 17 clearances of the match, with its eighth goal coming from its ninth centre bounce clearance of the match. All seven Richmond goals have been sourced from intercept possessions, with six of these won in the midfield zone. In 2016 the Tigers averaged 46.3 points per game sourced from intercept possession chains, ranked 14th in the league. Richmond won the final six clearances of the first half and the first six clearances of the second half, however the Tigers were unable to hurt the Crows from this source with just four taken inside 50 and two behinds the result. Jake Kelly has kicked his first goal at any level. Before tonight's match Kelly had played four AFL preseason matches and 10 AFL premiership season matches without a major score to his credit. Adelaide Crows InterchangeMitch McGovern off due to an injury. Jason Castagna made his senior debut last year and kicked two goals from his five games. In this game he has now kicked three majors from just six disposals, with all three from general play. In the first 15 minutes that quarter, the Tigers kicking efficiency was 77 per cent and they kicked three goals and hit the post twice. From there, Richmond's kicking efficiency dropped to 19 per cent and Adelaide kicked the final two goals of the term. After an early Richmond surge this term, the Tigers have butchered the football in the past ten minutes with a kicking efficiency of just 20 per cent. The Crows have won 10 intercepts in this period, taking four inside 50 directly resulting in 2.1 (13). Rory Laird has picked up where he left off last year. The 2015 and 2016 AllAustralian squad member has gathered 14 disposals at 86 per cent efficiency, as well as a game-high five intercepts. Last season Laird averaged 27.4 disposals per game. It's taken almost 15 minutes for Adelaide to hit the scoreboard in the second quarter, after six scores from nine forward 50 entries in the first term. Richmond has been more effective this quarter with 3.2 (15) from seven inside 50s. Richmond is now heavily capitalising on Adelaide's midfield turnovers. From 18 midfield intercepts, the Tigers have now created nine forward 50 entries and all four goals. In 2016, league midfield intercepts resulted in goals on 12 per cent of attempts. Richmond has significantly improved its ball use since quarter time. Only 53 per cent of the Tigers' kicks were effective in the first term, however this quarter that efficiency rate is now at 81 per cent. Richmond has won 13 intercepts in the midfield zone and has kicked both its goals from the resulting possession chains. Likewise Adelaide has also constructed two goals from nine opportunities launched from the same zone and source. In his first game in Adelaide colours since 2014 Round 20, Andy Otten has slotted back in nicely in the defensive half. Otten has amassed a gamehigh four intercepts, three spoils and two rebound 50s along with his seven disposals. 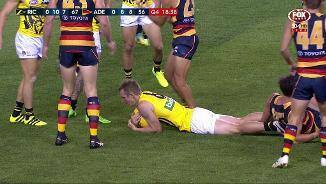 Richmond took the ball inside 50 on five more occasions than Adelaide, however was still outscored by 13 points. The Crows were more effective in attack, taking six marks inside 50 compared to just one by the Tigers. Richmond has been a little illdisciplined so far, giving away eight free kicks but only receiving two in return. Last season the Tigers received 18 free kicks fewer than they gave away. Adelaide is showing its potency is still there in 2017. The Crows have been inside 50 on three fewer occasions than the Tigers, however the visiting team has still managed four more scores. 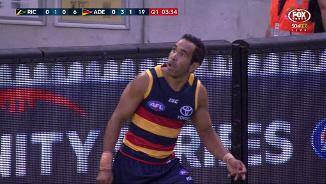 Adelaide Crows InterchangeCam Ellis-Yolmen off due to an injury. Josh Jenkins has kicked his first for the night after a strong mark inside 50. In 2016 he kicked a careerhigh 62 goals, the fifth-largest tally of any player in the league. McIntosh has put the Tigers on the board for the first time in 2017 after kicking truly on the run. Last season only 13.6 per cent of Richmond's score was kicked on the run, the lowest percentage in the league. 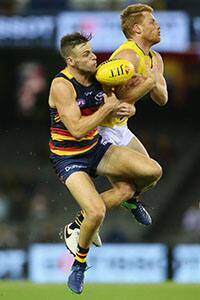 Adelaide has won five of the first seven clearances of the match. Following the latest won by Mackay in defensive 50, the Crows have transitioned to forward 50 and converted through Beech. Mackay averaged a careerhigh 2.3 clearances per game in 2016. It's been a scrappy start for Adelaide, with a kicking efficiency of only 33 per cent in the early stages. Richmond has been cleaner by foot, with 75 per cent of its kicks effective. 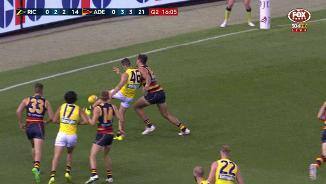 Adelaide Crows InterchangeJonathon Beech replaces Sam Jacobs due to the blood rule. These sides were chalk and cheese in many ways last year. 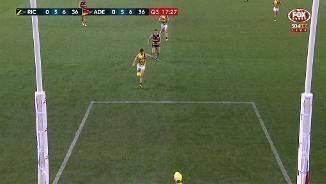 Adelaide spent over seven minutes per game more than its opposition in its forward half (ranked 3rd), a far better result than Richmond who faced almost an eight minute deficit (ranked 15th). Richmond and Adelaide have only met twice in preseason matches and not since 2002, splitting the encounters with one win each. 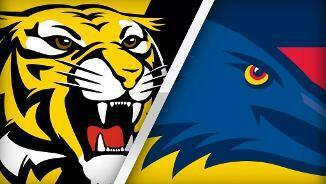 Last season the Crows defeated the Tigers in Round 3 at Etihad Stadium by 36 points. Welcome to Etihad Stadium for the Richmond v Adelaide Crows Round 2 clash. RICHMOND recruits Dion Prestia and Josh Caddy have wasted no time in showing what they will bring to the Tigers after excelling in the club's 19-point win over Adelaide on Friday night. In both clubs' first JLT Community Series clash, the pair each gathered 21 disposals in the Tigers' 0.14.8 (92) to 0.10.13 (73) win at Etihad Stadium. After being lured to Punt Road from Gold Coast on a lucrative long-term deal last year, all eyes were on Prestia and he let nobody down in his opening appearance, winning an equal team-high 12 contested possessions and four clearances. Caddy's move to Richmond happened quickly during last year's trade period and it was clear to see why the Tigers were drawn to the ex-Cat. His size and strength gave the Tigers a new presence at the stoppages, and he closed out his first game with six marks and a final-quarter goal to show his ability in attack. 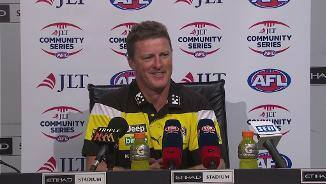 Just as the experienced pair excited Richmond fans, a number of the club's younger prospects also showed promising signs. In his second season Daniel Rioli (16 disposals) gave great dash, speed and class to set up numerous scoring chances, while small forward Jason Castagna kicked three goals. Dan Butler's toughness and zip around the ball also stood out, while Oleg Markov brings pace and a point of difference to the Tigers' mix. The Crows were missing more senior players than the Tigers, but hung in throughout the contest and will head back to South Australia with a number of positives. Young defender Harrison Wigg (23 disposals) impressed across half-back with his ball use and composure, while Rory Laird (33 disposals), on the other half-back flank, showed no signs of slowing down his development into one of the game's best rebounders. The club will also take great confidence from the seamless return to football by Andy Otten, who played his first game since round 20, 2014, after a shocking run of serious knee injuries. Otten moved comfortably in defence and finished with 17 disposals and six marks in a solid display. Adelaide's improvement this season will need to come from within after its inability to land Carlton star Bryce Gibbs last trade period. But the reemergence of former Greater Western Sydney speedster Curtly Hampton (16 disposals, two goals) should not be forgotten as part of their premiership assault, particularly after an impressive first-up showing for the Crows after missing last year with injury. Hampton's smooth movement set up the first goal of the game, to rookie Jonathon Beech, and the Crows looked slick pushing forward. 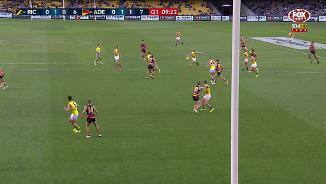 Their 13-point lead at the opening change came as a result of a more dangerous and prominent forward half, epitomized by a classic Eddie Betts checkside goal from the boundary line. But the Tigers would have been enthused by the run of a bulkier looking Rioli, while Kamdyn McIntosh, who played just six games last year due to an ankle injury, kicked a long goal and showed he would add some bite to their defence this year. It was another youngster who lit the Tigers' spark in the second term, with second-year forward Castagna booting two goals. His speed and tenacity created chances for Richmond, which used star midfielder Dustin Martin and new clearance partner Caddy in stints in attack as they took a five-point lead into the major break. A highlight of the match came early in the third term when Richmond ruckman Ivan Maric baulked an opponent in the back half to start a chain of possessions for the Tigers which finished in end-to-end major to Castagna. It was the first of a five-goal-to-three term for the Tigers, who took a five-point lead into the last change and showed off a more attacking and free-flowing game style. Spearhead Jack Riewoldt's final-minute goal of the last term – his third of the night – iced the win for the Tigers. Star midfielder Rory Sloane, who the Crows hope to be ready for round one after fracturing his eye socket, led the contingent of notable absentees for Adelaide on Friday night. Brad Crouch, Scott Thompson, Jake Lever and Kyle Cheney were among the other important Crows missing. Richmond was closer to full strength, with star defender Alex Rance and ruckman Shaun Hampson the key outs. Richmond: David Astbury might be about to enter the prime of his career. The tall defender played 19 games last season – the most of his career – and took great confidence from that injury-free run. But heading into his eighth season in the AFL, Astbury may be ready to become the intercepting, agile and important backman Richmond needs to stand next to Alex Rance through the season. Astbury was excellent against the Crows, holding Adelaide skipper Taylor Walker goalless and keeping him to just 11 disposals. 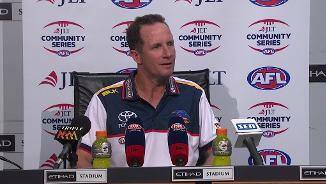 Adelaide: Despite the defeat, the Crows will continue to be one of the hardest teams to stop from kicking goals. After leading the competition last home and away season for points scored, Adelaide's attack hasn't lost any impetus. Josh Jenkins (four goals), Eddie Betts and Tom Lynch all played a part on Friday night, while Charlie Cameron and Wayne Milera also showed flashes, all with Walker kept relatively quiet. Crows coach Don Pyke has a formidable forward line in his hands and the club's opening pre-season contest was a nice reminder of just how quickly it can score and how dangerous it can be. Richmond: Pencil in Dion Prestia to be right near the top of Richmond's disposal winners every time he plays. The midfielder is clean and classy and a step ahead, and had a very solid first showing for the club. Former Cat Josh Caddy finished with 21 disposals, while ruckman Toby Nankervis gathered 15 disposals to go with his 14 hit-outs. Overall the Tigers would have been pleased with the output of their new batch. 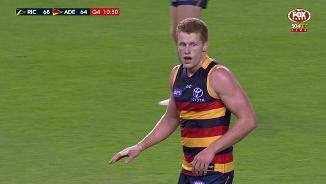 Adelaide: Harrison Wigg stole the show for the Crows' new faces, with the smart left-footed defender finding 23 disposals and using them well off half-back. Draftee Myles Poholke was quieter in his first appearance for the Crows (nine touches) but didn't look overawed, while Harry Dear (10) and Jono Beech (one) also had limited influence. More encouraging was the showing of former Greater Western Sydney defender Curtly Hampton who, after spending last year on the sidelines with injury for the Crows, showed real dash and poise with the ball. Both sides play their second JLT Community Series contests next Sunday, March 5. Richmond will travel to Mount Gambier to face Port Adelaide, while the Crows will take on the Cats at Richmond Oval in South Australia.